there’s this really great place, right ? it does fish and chips, right ? 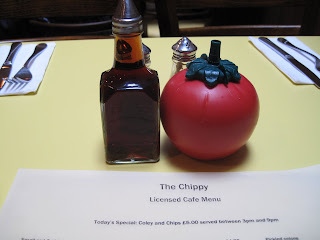 and they have tomato ketchup in these big red plastic tomatoes on the tables, ok ? how cool is that ? anyway they do saveloy and chips, right ? not exactly sure what a saveloy is, but they do it, anyway. 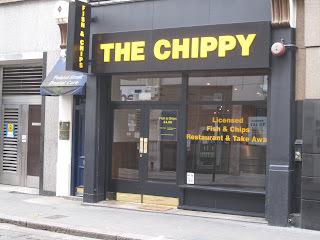 and, and, get this…it’s called the chippy. how brilliant is that ? 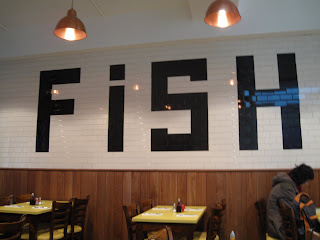 like that‘s what people call fish and chip shops, right ? and it’s got all these tiles on the walls just like…chippies… used to have ages ago, like in the seventies, like in life on mars or something like that….er, i’d imagine. Imagine away my young friend. Nothing wrong in that. 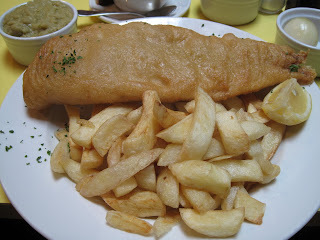 But writing as one who has lived through several decades, one of which was the Seventies, I can tell you there never was a Chippy quite like The Chippy. Still it’s nice that the owners have put some time and effort into the décor: it helps to take your mind off the food, or more specifically the Fish and Chips, which are not very good (I think HS would probably have another word for them, a very rude one). Northerners would laugh at the size of my large Haddock which barely reached the sides of the plate. They wouldn’t be so happy with the way it was prepared. The batter was crisp but strangely pale and the predominant taste was of oil. 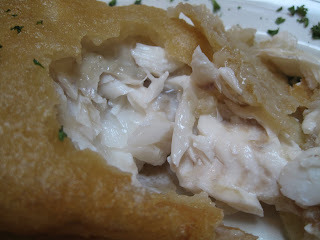 The fish inside was disappointingly soft and instead of breaking away in firm flakes disintegrated under my hard stare. Things were a bit better and firmer at the prow end which probably indicates overcooking. In an empty restaurant why the fryer couldn’t concentrate on preparing the best ever Fish and Chips beats me. It might have been the close proximity of the blond waitresses which was distracting him. Or maybe he just can’t cook for toffee. 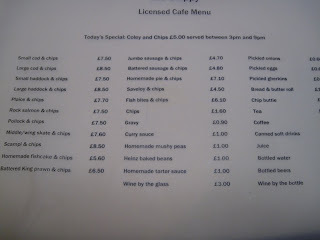 Chips were like proper Fish and Chip shop er, chips. But the carb element in the meal is just meant to bulk it out a bit not take over the star role. Mushy Peas at least looked the right colour, which is a good thing, but they had little bits in them which might have been un-reconstituted peas. Which is definitely a bad thing. For Central London it was relatively cheap but as with so many things you get what you pay for. In this case you’re paying, not for the food, but for a room with tiles and red plastic tomatoes and everything, although in a country where form is prized above function this is not so surprising. Right ? That fish looks horrible. Glad to report that Masters, on the basis of last Saturday's visit, is still up to snuff. Have you ever pronounced on the best UK F&Cs (in your humble opinion)?